As one who's dropped his iPhone face down on a marble floor, I can attest to the necessity of an iPhone case. But everyone's got those rubber things. Wouldn't it be nice to have a case that constantly reminded you that the engine in your garage isn't going to rebuild itself? 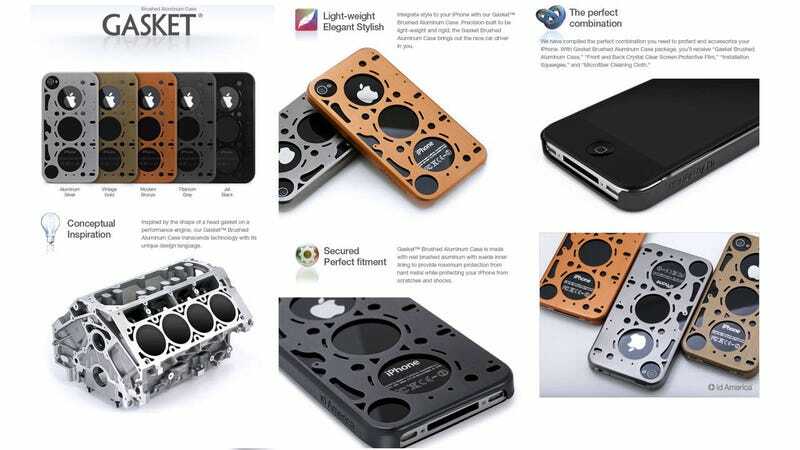 Check out id America's Gasket Brushed Aluminum Case. (We're just calling it the "gasket case." The design firm says it's inspired by the shape of a head gasket on a performance engine. And, lo, it does resemble one of those, doesn't it? It's made from brushed aluminum with a suede inner lining. BUT WAIT. For your $29.99. You also get protective film, an "installation squeegee" and, because they come with everything these days from TVs to Big Macs, a microfiber cleaning cloth.